I think one of the many difficult things in having a child ... or, ahem, children ... with special needs is appropriately discussing their differences with their siblings. 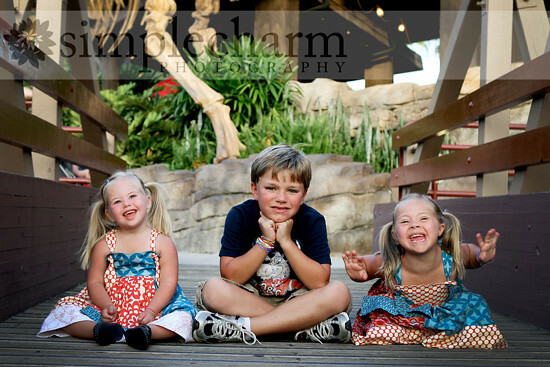 I remember wondering, "When is the right time to discuss Down syndrome with Mason?" I mean, we have always just talked openly about how the girls learn slower than he does, but as far as really getting to the core of the subject ... well, I just wasn't sure how to approach it. So then, one day ... I just asked him, "Mason, do you know what Down syndrome is? Do you know that both of the girls have Down syndrome?" I was all feeling empowered, like we were going to have this big heart to heart ... and quite frankly, he could have cared less ... he was mostly interested in knowing when he could get back to his video game. This really was a lesson to me that it really doesn't matter what it is called ... he still loves his sisters the same. We still talk about it openly and I guess he will ask more questions when he is ready. questions. Bring up the topic routinely in conversation. 2. Allow brothers and sisters to express negative feelings. someone with a disability And don’t expect siblings to be saints. stressful and do what you can to help minimize the difficulty. them to be brothers and sisters, rather than becoming an extra parent. a family full of parents. schedule special time with each of your children. It's so funny that you posted this. I've been thinking a lot about this over the last day or two, mostly b/c our Buddy Walk is this Saturday and I'm curious how the boys (siblings ages 4&5) will be, so far their innocence hasn't let then notice Kaitlyn's disability. We've decided to answer their questions as they come. We are signing with KT and just pointing out the importance of giving her a way to communicate with us until she can talk. I've been thinking about what we will say when they ask about Ds, or when we explain to them what it is. Will they make a connection this Saturday? I'm just going to pray God gives me the words, and that I keep it age appropriate, one question at a time! i have been thinking a lot about it too, we dont have more kids, but we have many friends with kids, and also kids frm church who i know some day they will start asking questions, and i hope they come to me and ask me and hope they still care and love Elias. My 4 yr old was looking through a box of old baby shower cards. In the box was also her hospital ID bracelet. She has seen several of Max's laying around the house, so she knew what it was, but was suprised it was hers. She said, "Oh, cause I was Down syndrome too?" Yeah - she doesn't quite get it yet! I guess I haven't really figured it out yet.. Interesting list. Reading it is bringing out some guilty feelings in me. #8 is the most important, because without it things like #4 can be very hard. I have 4 kids and sometimes they just have to look after each other. Thanks so much for sharing! I was just thinking about this the other day as well. Like I want our older daughter to be familiar with other kids with Ds- but I also don't necessarily want to single out the trait as the most important thing about Abby. When I read number 5 it had me thinking that I also want to be sure to note things about Abby that are special that don't have anything to do with the Ds too. This is an awesome post. Thank you very much for sharing! These are really great tips -- thanks for sharing. Our kids know all about Ds and talk about it to their classmates whenever it comes up. They're very comfortable talking about it, even Greta at age 5, and the 2 oldest want to go to the NDSC brother sister conference next year. #4 is one that I try to make sure they have lots of fun time with John Michael and only occasionally have to watch him for me so I can get something done or tend to the baby. I love the photo. Mason really is a character and the girls are GORGEOUS! I wonder about this also! When I first received the news of our Elijah's diagnosis, I first worried about how it would (negatively??) affect our firstborn. Luckily, I found a lot of great, reassuring and uplifting information about how siblings fare. Thanks for the tips- they are GREAT reminders! !